Focus a Topic - Consult your textbook, your assignment guidelines, or your professor for appropriate topics. Our "Developing a Research Topic" tutorial may be of helpful. Choose a Database and Find Material - Use the "REES Articles" or "PITTCat+" tab above. Find a Book - Use the "Books" or "PITTCat+" tab above. Find Country Specific Resources - Use the "REES Country Web Resources" tab above. Find Statistics - Use the "Statistics" Or "Statistical Web Links" tab above. Cite Your Sources - Use the "Writing & Citing" tab above. Determine if Sources are Scholarly - Use the "Evaluating Sources" tab above. This guide highlights important high quality resources for Russia and East European Studies (REES) research. It also identifies major national and international resources. The information included here should be treated as entry points for further documentation and bibliography. The tabs at the top of the page will connect you to categories of resources and information. 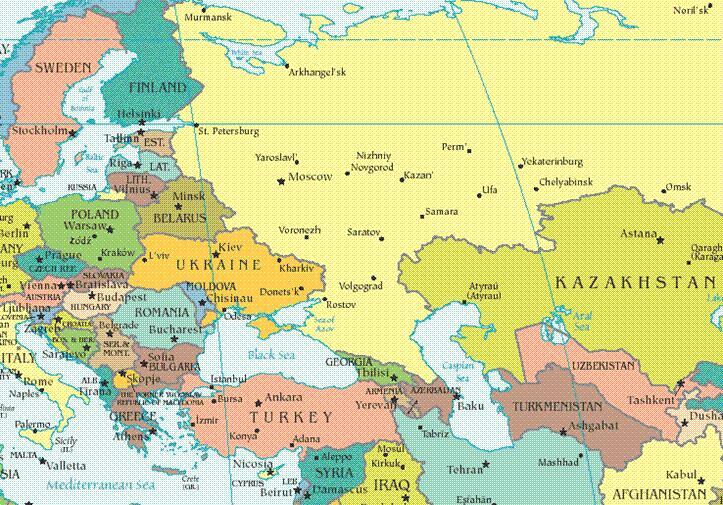 Albania, Armenia, Azerbaijan, Belarus, Bosnia-Hercegovina, Bulgaria, Croatia, Czech Republic, Estonia, Georgia, Hungary, Kazakhstan, Kyrgyzstan, Latvia, Lithuania, Macedonia, Moldova, Montenegro, Poland, Romania, Russia, Serbia, Slovakia, Slovenia, Tajikistan, Turkmenistan, Ukraine, and Uzbekistan. This interdisciplinary subject area covers nearly all areas of the social sciences and humanities related to these countries, as well as material on their environments. The material is in English, languages of these countries, and other Western languages. For additional resources and information see: the Department of Slavic Languages and Literatures, the University of Pittsburgh Center for Russian and East European Studies, and the REESWeb: Russian and East European Studies Internet Resources pages. The Russian and East European collection consists of over 400,000 volumes, (approximately 260,000 are in the languages of the area), plus hundreds of newspapers and periodicals from or about the region. Many of the latter are in electronic format, on external databases, or on CD-ROM. The East European collection includes nearly 70,000 holdings in Polish literature, history, politics, and culture as well as rare books, newspapers, and musical scores that were formerly housed at Alliance College. Strengths of the collection are Russian and Polish history, literature, culture, political science, economics, international relations, and the life of immigrants from these REES countries in the United States. Polish-American resources are especially well-represented at the University of Pittsburgh. There is also a special collection of Slovak monographs and serials. Pitt has been actively working to enhance the Slovak, Bosnian/Croatian/Serbian, and Romanian collections overall. An extensive exchange program of materials with Russian and East European institutions provides material unavailable through other sources. Holdings estimates are currently about 56 percent Russian centered, 18 percent Polish, 9 percent Serbo-Croatian, 9 percent Romanian, and 8 percent Slovak. A collection of over 6,000 Russian and East European films, which is under continuous development, is housed in the University's Stark Media Resource Center located in Hillman Library. Other materials relating to the region are found in the Frick Fine Arts Library, and the libraries of the Barco Law School and Katz Graduate School of Business.